ALLAH WAS INVOKED THAT DAY, after a wood-fired breakfast in an 18-degree dawn. The earth was cloaked anew; hoarfrost made the grass crunch under my boots. Wind ripped away the plume of Daniel González’s breath. Winter in southern Chile, one of the southernmost places on earth. The pickup truck, already humming in the near-dark, gave me a static shock big enough to light a cigarette. The white four-door rig was plastered with decals reading PATAGONIA SIN REPRESAS—Patagonia Without Dams—the coalition that González, the campaign’s appealingly bedraggled coordinator, was here to fight for. A set of new dams is now slated to choke off Chile’s biggest river, the Baker, here in the deep south. In the frozen daybreak, we were headed into a remote valley in search of a one-eyed cowboy with a little of the future in his hands. For the next four hours we drove, crashed, slid, hiked, ice-walked, and bog-stomped, eventually arriving on foot in the pristine pastures of the isolated Nadis Valley. This region, called Aysén, is a Patagonia of the imagination, a rippling landscape that stuns even repeat visitors like González into silence. There is a reason ancient people worshipped mountains. There is a reason modern people carry trout rods. You enter, helpless as a dreamer, into a humbling realm of sheer granite and luring vistas, all of it wrapped in Andean peaks holding 13,000 square miles of glaciers. The Northern and Southern Patagonian Ice Fields are the world’s largest outside the poles and Greenland, making up one of the planet’s most accessible big reserves of freshwater. Around lunchtime we stumbled upon the lonely old huaso, or cowboy. Arturo Quinto acted unsurprised that people had walked in, during the first hard freeze of the winter, to find him. He had a bushy monobrow, two sweaters, baggy blue pants tucked into black rubber boots, and a furry brown horse. Quinto tossed things onto this wide-hoofed Criollo pony—a pad of foam, a blanket, two sheepskins, more foam and blankets, and finally a thin piece of leather—until he had a Chilean saddle. Only when he mounted up did I see his age; this hairy, virile creature, with one eye gouged out by a branch and a huge knife tucked in the small of his back, was in his seventies. With a gruff command to follow, he started at a canter for his puesto, or hut, his dogs yelping around him. Cowboys are taciturn. It’s the sheep. 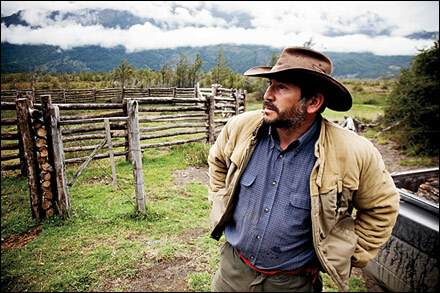 Quinto was one of half a dozen holdouts along the Baker who have refused to sell their pastureland to the multinational conglomerate, HidroAysén, which is on the brink of constructing five dams in the region. Three will be built on the short, turbulent Río Pascua, a Class VI favorite for expert kayakers, just to the south, but the first two will be constructed here on the Baker, the second one plugging the exit from Quinto’s valley. The Baker is a cold, intimidating snake, born in a massive lake, Lago General Carrera, on the Argentina border. It carves just 110 miles down through Aysén in a hard S, collecting glacial tributaries and raging at 30,000 cubic feet per second even in its headwaters, like a blue-green upper Colorado at flood. The torrents that now carry rafts and kayaks would be a perpetual gold mine for an energy company in a country with some of the highest electricity rates in Latin America. HidroAysén already has the key water rights to the Baker and the Pascua. Land rights are a minor issue—the five dams will drown less than 15,000 acres total, and if Quinto refuses to sell his meadow, a committee of “hombres buenos,” or prominent citizens, could step in to negotiate. When we finally got out of the wind, Quinto’s 12-by-12-foot shack felt like a mansion. The room had pictures of girls in bikinis and was full of hanging meat. He fired up his woodstove, and González handed over a bag of green mate tea and a box of Santa Rita 120, a dreadful Chilean wine that tastes excellent when consumed cold, in the cold, beneath gobsmacking mountains, by a fire, with dinner rolls, ham, and cheese. Any day that includes a place like this is a good day. Quinto played guitar, and we drank the wine and bitter tea all afternoon, until the howling wind reminded us to be gone before darkness. González grunted. Business at last. “Anybody mess with you?” he said. This was the question we had come all this way to ask. Unfortunately, it isn’t God, Quinto, or González who will approve the dams. The earth is already moving under this debate. And if you want to shake up the future, an 8.8-magnitude earthquake like the one that rocked Chile on February 27 is one way to do it. I MYSELF HAVE BEEN in two earthquakes in Chile, including a 6.0 shake that knocked me off the can one morning 14 years ago. Buildings cracked, but nobody died. A naked woman ran down the hotel hallway shouting “Salé, salé!”—Get out, get out! You can’t outrun geology. The quake that devastated the city of Concepción crushed at least 500 people, toppled buildings even in Santiago, and threw a question mark over the future of HidroAysén. The project depends on moving power 1,500 miles north from Aysén, up a Ring of Fire obstacle course that passes beneath active volcanoes (Chaitén erupted in 2008), along the subducting Nazca fault line to Valdivia (site of the world’s largest recorded earthquake, 9.5, in 1960), up a narrow coastal plain subject to tsunamis, and then around Concepción (which shook for 120 seconds, three times as long as the San Francisco earthquake of 1906). Down in Patagonia, this would require a 500-mile clear-cut. The transmission line would pass by or through three national parks and a dozen protected areas, including wetlands, designated tourism zones, and the 762,000-acre Pumalín Park: all this to reach Chile’s mainland, with another 1,000 miles of ugly to go. In Patagonia, the view would include thousands of steel towers up to 230 feet tall, draped in black cable. After more than $6 billion and at least ten years of construction, the five dams would produce perhaps 2,750 megawatts, about 20 percent of Chile’s current electricity-generation capacity—and a little over 10 percent of projected national capacity in 2025, when the dams might go online. Like other South American countries, Chile has a love affair with hydropower, relying on it for almost 50 percent of its electricity. HidroAysén was conceived two decades ago by the state utility company, Endesa, which dammed the Río Bio Bío in 1992, killing that euphonious river and the thriving whitewater tourism it supported. During the nineties, the plans lingered while Chile looked to its neighbors for power. But Bolivia, still piqued over a military defeat in 1884, blocked development of a natural-gas pipeline, and, in 2004, Argentina restricted gas sales to Chile, claiming the supply for itself. Chile uses only 1.5 percent as much electricity as the United States, but until 2004, demand was rising at an annual 6 percent. A domestic, year-round, glacier-fed power supply was starting to look better and better. Now Endesa—which had been privatized, sold to Spaniards, and then sold to a partially state-owned Italian company called Enel—has returned to the project, partnering with Colbún, one of Chile’s biggest energy companies. The next step is also the last: HidroAysén has submitted an environmental impact assessment, which must be approved by a regional commission. But the real power, observers say, rests with Chile’s new president, Sebastián Piñera. On the surface, Piñera—a conservative billionaire whose anti-regulation agenda is now accelerated by the suffering and $30 billion in damage caused by the earthquake—would seem decidedly pro-dam. His new energy minister immediately noted that, since not a single dam cracked during the earthquake, the Aysén project looked “very attractive.” But Piñera is also a conservationist whose nonprofit foundation, in 2005, made one of the largest land donations in Chile’s history, to create a 292,000-acre park on the island of Chiloé. The issue, he said, is not so much the land the dams would submerge but the transmission line, which leaves Chile vulnerable to geology. After the Concepción quake, a single failed transformer blacked out 90 percent of the population. Could another long-distance project really be the answer? Like Piñera, Chile straddles a fault line between two paths for development. Mining copper, cutting lumber, and damming rivers have been common here for a century, but Chile has a winning ticket to another kind of extraction, with abundant renewable-energy potential in its sun-drenched deserts, blasting winds, and surging tides. Hardworking little Chile, with just 17 million people and a minimum wage of $315 a month, has a chance to vault directly into the age of alternative power. The question is whether they’ll jump. COUNTING FROM THE NORTH in a very long country, Aysén is Chile’s 11th region, part of the isolated Patagonian extension, a land accessible to the rest of the nation only by boat. The nearly 800-mile Carretera Austral is the region’s lone “highway,” an aggregate of dirt, loose gravel, fits of pavement in places, some mud and potholes. I’d shattered a rib here in 1996, crashing my motorcycle into the brush on a rainy dusk, and still dreaded the road. But by driving 500 miles of the highway, from melting glaciers to smoking volcanoes, dam sites to tsunami zones, I could see for myself what would be lost in a plugged-in Patagonia. González and I woke up on day two in a freezing guesthouse in the Chacabuco valley, once the area’s largest sheep ranch and now a 174,000-acre park-in-the-making. Well before another cold dawn, we were rolling again along rutted dirt tracks. At a crossroads we walked through a field of frozen thistles as swallows darted overhead. We came to a lookout over the confluence of the Baker and the Río Chacabuco—the proposed site of the first dam. The Baker jagged down here, spilling from a chute of brown metamorphic rock to join the smaller Chacabuco, aquamarine with glacial silt. The dam, Baker 1, will go across that canyon. Its turbines could churn out a continuous 660 megawatts, about a third of capacity at Arizona’s Hoover Dam. The dam would swamp more than smoky little Cochrane. The sprawling Estancia Valle Chacabuco was bought in 2004 by conservationist Kris Tompkins, former CEO of Patagonia Inc., and her partners in the land trust Conservacion Patagonica. The plan is to give the land to Chile as part of a future 750,000-acre Patagonia National Park. Tompkins is half of the American wonder couple of environmental philanthropy, along with her husband, Doug, founder of Esprit and the North Face. Back in 1992, Doug brought the Rockefeller model of conservation—buy wilderness, make parks—to Chile, carving Pumalín Park out of the heartland forests in northern Patagonia. 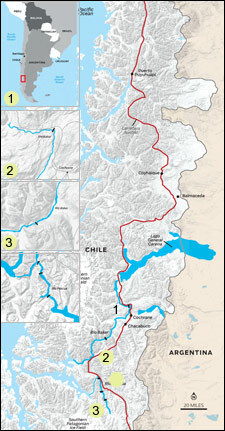 The dam would rise right outside Chacabuco; its snaking power line would snip a clear-cut through Pumalín. I would. It’s nicer without the pylons, of course, but my 500-mile tour of the transmission route would essentially take me from Kris to Doug, from Chacabuco to Pumalín. The Tompkinses bracket the anti-dam movement in a similar way. Nominally, the Patagonia Without Dams campaign is a coalition of more than 50 groups, including heavyweights like International Rivers, the Natural Resources Defense Council, and Patagonia Inc. International Rivers has convinced the Spanish bank BBVA not to finance the dams, and the NRDC sent down energy experts and designated the region a BioGem, their top-priority conservation zone. But within Chile itself, the Tompkinses are the largest individual funders. 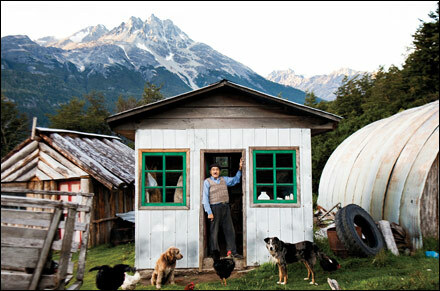 Their Pumalín Foundation supports groups like the Defenders of the Spirit of Patagonia. Doug pays for television commercials, supplies pickup trucks, writes checks to groups like Ecosistemas, and dashes off angry letters to Patagonian newspapers. One Chilean who does seem to like Tompkins was just elected president: the billionaire Piñera, whose Chiloé land gift was made after consulting with Doug and Kris. Doug himself flew Piñera over the region twice, to inspect the blue whale feeding grounds along the coast and the forest tracts that would fall to the power line. “I am not about to say he has a great wilderness sense,” Doug reported by e-mail, his phones still down long after the earthquake. But the president “is a big step ahead of most politicians” and “enough of a conservationist” to value old-growth forests over a 1,500-mile extension cord past volcanoes, tsunami zones, and tectonic faults. No matter how much money Tompkins throws into the anti-dam campaign, domestic environmentalists have little influence in Chile, where a powerful elite favors resource extraction. But despite the regional commission that control’s HidroAysén’s fate, a canny chief executive could maneuver the project back into a filing cabinet using his control of appointments and the bureaucracy. That is, of course, if Piñera were so inclined. GONZALES LED OUR two-truck convoy up into a headwaters area, where glacial tributaries poured down from the Northern Pata­gonian Ice Field. The road became a trail through white fog, iced trees, and sugar-dusted meadows where frozen puddles shattered under our tires. When Garrido got mired in a bog, we left his pickup with a horseman in sheepskin chaps. Piling in with us, he discussed how the CIA had staged the September 11 attacks, and then free-associated on the farmhouses we passed (“He’s not for or against, but his niece works for HidroAysén”…”This lot touches the river”…”This one too…”They’re holding on, but only for a better price”). Some of the locals are holding on quite literally. We beat the truck up into a small meadow where the glacier-fed Colonia enters the Baker. In a tiny house, three generations of a farming family roasted lamb and potatoes for us, and the patriarch, 74-year-old Everardo Ojeda Diaz, described how the overnight melting of ice dams was dumping entire glacial lakes into the Colonia and thence the Baker, swelling its flow to 120,000 cubic feet per second. In his first 40 years, he’d seen one of these glacial-lake outburst floods, or GLOFs, and that was three decades ago. There have been seven in the past two years. Once again Chile’s nature was threatening to smack down human ambitions. The whole point of the dams is that these ice fields provide a year-round source of power. Yet climate change already threatens that equation as the glaciers retreat at unprecedented rates. Putting five reservoirs inside this bowl of ice would block the fluid circulation of air and water, potentially raising temperatures and accelerating the melting of the dam’s power supply, warns Jonathan Leidich, the owner of Patagonia Adventure Expeditions and creator of the local Aysén Glacier Trail. What’s more, he says, a single big GLOF could dump 100,000 cubic feet of silt into the Baker 2 reservoir slated for Quinto’s valley. Leidich thinks that dams would kill the tripod of sustainable economic development in Aysén: ecotourism, responsible ranching, and expeditions to the ice fields for science and education. Tourism “builds value on the environment,” he said. Dams undermine it. For his part, Ojeda took me outside and pointed to a line of driftwood that marked the high water of the last GLOF. For six hours the water rose, destroying their potato crop. They moved their sheep, worth $65 each, to higher ground. But about 40 cows in the area died. González and I continued north on the Carretera Austral, a fast, physical drive on wet gravel, exhausting and dusty but punctuated by spectacles worth the admission price: every now and then, a loose string of horses; crystal green rivers where I cast in futility for trout; 50 longhorns expertly pushed off the road by a father-son team of huasos; the silence of a tall forest of conifers; rain, then sun, then rain, then sun; the tiny hamlets under blankets of woodsmoke, serving up empanadas and humble dreams of tourism, of development, of any kind, sometime soon, please. Half the signs in windows were for HidroAysén; half were against. I’d heard talk that the construction would triple Aysén’s GDP for a decade. By some estimates, however, 95 percent of the money would flow right back out. The workers would all come from elsewhere. Aysén still is. It’s still a paradise of monster wave trains and soul-restoring forests, and the place where today’s conservation battles must be fought. I myself never fully came home from my first trip to Patagonia. There should be such places, which is my own unapologetic reason for hating the dams. SOMEWHERE IN OUR fourth hour of driving, González picked up a hitchhiker, a naive young shepherd fresh from the meadows. A surveying team from HidroAysén had told him that “everyone” would get paid for allowing the power line to pass through their area. “Did you know they also get the mineral rights?” González asked. A stiletto. The question punctured this poor dreamer’s hopes. Mineral rights? What if his meadow had gold in it! He was suddenly against HidroAysén. I continued north, filling his loaned truck with hitchhikers, until at dusk we came around a mountain to find a thick gray cloud: Coyhaique. Aysén’s capital is a quickly growing town of 45,000. In the summer it’s a green and wet place, where a cozy fire may warm a tourist’s toes. But in winter, 97 percent of homes burn wood, and Coyhaique has the worst air quality in Chile. The pall of heavy particulate matter reaches densities at least four times World Health Organization limits, causing asthma in the elderly and sometimes closing schools. Firewood generates an incredible 57 percent of Chile’s rural residential energy, and Coyhaique proves that health needs alone demand electrification. “Chile is where the U.S. was 50 years ago,” González had told me. “More like 80 years ago.” The memory of poverty is fresh, and people want electric teakettles, microwave ovens. Green energy won’t be cheap—the World Bank estimates that $100 billion a year will be needed to help developing countries make the switch—but if there were ever a place to bend this curve to the future, here it is. Chile is entrepreneurial (that’s you, Mr. President! ), in love with technology (with the highest broadband connection rate on the continent), and flush with engineers and copper revenues. Above all, this country is an oil hater’s dream. In the desert north, “we have infinite potential for solar,” Orrego said. Geothermal sources underlie the length of the Andes, close to every market in the country. Tidal forces north of Pumalín give Chile a “unique global potential” for generating power, according to the National Energy Commission. Chile has enough low-hanging fruit, Orrego believes, to skip the dams easily. A conservation campaign during the 2004 natural-gas shortages saved 10 percent of consumption. Renewables still make up just 3 percent of the nation’s energy, but multinationals are crawling over the Atacama Desert drawing up solar projects, and the state copper company is finally investing in wind. HidroAysén’s output could be matched by four massive wind farms like the ones in Horse Hollow, Texas. That night, in Coyhaique, a municipal hall was given over to a rally. About 70 eco-enthusiasts sat facing a photomural of sylvan excess that read PATAGONIA SIN REPRESAS. Actually, the trout don’t get a vote. ON DAY THREE I blew north again, alone in a rented Fiat in fire-engine red. The road took me past sea lion fjords where the tides ran outbound at seven knots, delivering untapped megawatts twice a day. I’d flown along these ridgelines in a helicopter once, the verdant forests climbing right past our rotor tips, the glacial cirques reduced to circus rings. But on foot, this country was a vast, impenetrable thicket, what Darwin called “a green desert,” a trackless misery to men without Gore-Tex. Here I’d threaded into swamps in fantastic downpours to land some of the biggest trout of my life. The air was so pure, my eyes felt 20 years younger. Land remakes us, and the feeling of the last valley at the end of all roads is itself worth saving. The fourth day was easier, flatter—300, then 350 miles behind me—and then came the turnoff to thriving little Futaleufú, Chile’s whitewater capital. González had told me that some Chileans resent the “rich Americans” who want to save rivers to play in them, or simply for the rivers’ own sakes. But Futaleufú was proof of a more broad-minded Chile. The threat of dams and gold mines here has been put off time and again because Chileans, especially the owners of profitable ecotourism companies, have fought back. There’s similar hope for HidroAysén to the south. Near huge Lago Yelcho, I drove past the sad spot where I’d crashed my motorcycle 15 years before and then on to Santa Lucía, a grim, pro-logging town where people thought Tompkins was a devil. I had to bum around the village on foot to buy ten liters of gas. Finally, the road juked left, over a small bridge, into Hell, formerly known as Chaitén. Before the volcano—like five months before, when I’d been here myself—Chaitén was a bustling town of 4,000, Chilean Patagonia’s central tourism gateway. But in May 2008, the Chaitén volcano shot ash 55,000 feet into the atmosphere, painting a streak of Chile and Argentina white. The town, six miles upwind, survived at first, but after ten days it began to rain, and the ash flushed down the steep Andean watersheds to form a lahar, a moving wall of volcanic mud. There was just enough warning—about three hours—to evacuate the town’s last stragglers, but about 70 percent of the street grid was buried. Most of Chaitén was waist deep in a kind of natural concrete, too hard to take my bootprints. The Chilean government had declared the place forever unsafe, cutting off electricity and heat. About 80 people were refusing to leave, but the schools had been closed, and police checkpoints kept out most visitors. 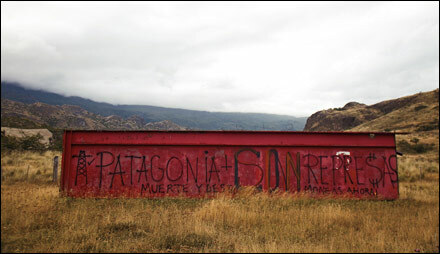 The fury of the holdouts was spray-painted onto the ruins: CHAITéN WILL NEVER DIE. They were as stubborn as the shepherds down south. A beautiful A-frame had been dug out of the muck, every window repaired, every ceramic shepherdess lovingly restored to the mantel, and a Chilean flag run up the pole. It sat five feet down, inside a bunker of mud. The shop where my motorcycle was welded was a floodplain of rusted machinery. One of the town holdouts was an American, Nicolas La Penn. He’d hiked to the volcano recently but refused to go back, worried that a pyroclastic flow—a belch of 800-degree gas—would turn us into particulate matter. “Don’t climb the volcano itself,” he warned. The trees were tawny and bare—a pyroclastic explosion had singed off their bark and twigs, leaving a forest of gray-brown spears. One last bend and there was the peak, or what was left of it, less than a mile from the road. I checked the wind and walked in. The forest, buried in ash heaps, was a battlefield. I used a streambed to make progress, slowly working my way up a canyon, right to the flank of Chaitén. A brief wind shift—the faint odor of sulfur—knocked me to my senses. The ravine was a trap, the perfect channel for a flash flood or a sudden flow of hot gas. Even HidroAysén had started backpedaling, claiming that the power line would go inland here or pass under the sea to Chiloé. As if you could pick your day and place. Hell follows. I turned back. Everyone has to, sooner or later. Not every future is worth having. 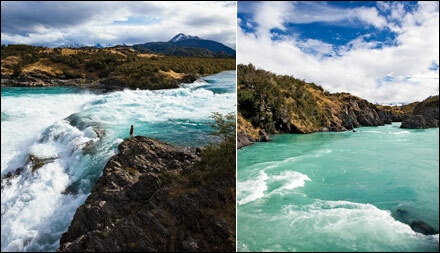 via Dams in Chilean Patagonia | Nature | OutsideOnline.com.